Florence Edmunds marries Joseph K. Like, 1911. 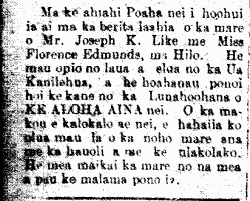 On this past Thursday [8/31/1911], joined together under the holy covenant of marriage were Mr. Joseph K. Like and Miss Florence Edmunds, in Hilo. They are both youths of the Kanilehua Rain, and the groom is a cousin of the Head of this paper “Ke Aloha Aina” [Edward L. Like]. We pray that the days of your marriage are followed along by joy and prosperity. Marriage is wonderful thing for all, should it be treasured. Ke Aloha Aina, Buke XVI, Helu 35, Aoao 4. Sepatemaba 2, 1911. George Kainapau, singer from Hilo, 1944. Last week, a youth from the Kanilehua rains arrived, that being George Kainapau to Hilo nei, to spend some days here in the land of his birth, and in the afternoon of the following Monday he left for Honolulu. This was not a child coming home to visit his parents living there, for they passed away many years ago, and their children are who remain. When we saw that youth, we recalled our first choir leader, Harry Naope, because this youth, George Kainapau was one of the members of the Haili choir in 1927. Another love song from a hundred years ago, 1914. I lei kai mana no kuu kino. 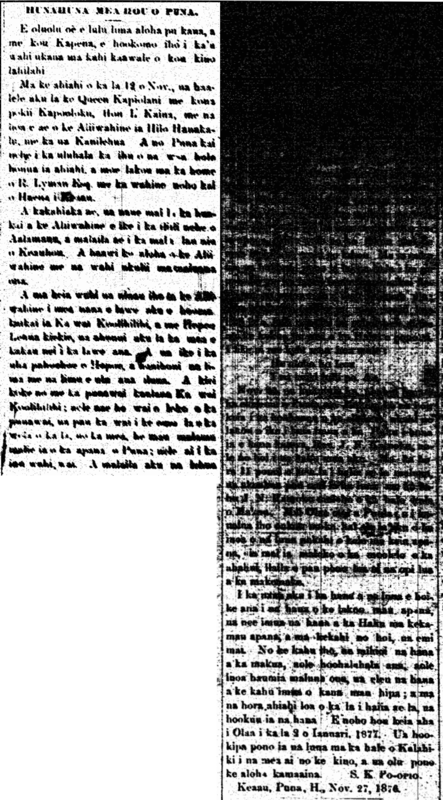 [Newspapers until their close were a place to publish mele of all sorts, whether it be mele aloha, ko’ihonua, kanikau, &c. If you are a composer or aspiring composer, this is one of the best places to study tradition, if you are interested in tradition. Sometimes, the typesetters weren’t very careful, especially in the later years, and more so in some papers than in others. The word breaks in this mele by Hilo boy, William D. Kawailehua, are not very consistent, but well worth working out in your head. Ke Aloha Aina, Buke XIX, Helu 38, Aoao 4. Iune 27, 1914. There will be first-class Hawaiian Hula which have never been seen before here in Hilo, being shown at the Waiakea Theater on the evening of this Saturday, June 6, at 7:30 P.M. One of the famous Hawaiian expert hula practitioners of Honolulu, Mrs. Hiaa, is the kumu of this hula troupe, along with her daughter, a girl that is skilled in the art; and she also has accepted two more girls from Waiakea. And on this past Memorial Day [La Kaupua], they held a public show (called uniki or hu-e lepo perhaps in Hawaiian). According to those who were present on that day of the performance, it was the best that they had seen, and it was beautiful in all respects, with the elegant swaying of the hips of the Hawaiians. One of the most marvelous things and a reason for all of you fun-loving Hawaiians of the Kanilehua Rain to go and see them, is because they were trained until proficient in this skill right here in Hilo, and they can most definitely be compared to the troupes of the royal court of Honolulu who are continuously training. And on that evening, you will hear the chanting of the name chant of Kalanianaole. Come down to witness for yourselves; just hearing about it is nothing. Entrance is $.25 and the upper level seats are $.50. Ka Hoku o Hawaii, Buke 8, Helu 52, Aoao 3. Iune 4, 1914. Marriage announcement outside of the Vital Statistics Column, 1912. Within the Anglican Church of St. Andrew’s, on this past Saturday evening, the youths, Miss Annabel Low and Albert Ruddle were joined together by the Rev. Leopold Kroll. The bride was donned with a white dress and a sheer veil, and atop her head was a lei of orange blossoms. She held a bouquet of flowers in her hand as seen in all marriage ceremonies, and she held a book of prayers in her hand. It was her father, Eben Low, who gave her into the care of her new parent, her husband. Misses Glorinda and Laura Low were the bride’s maids, and they held in their hands, bouquets of lavender roses. The best man was Mr. Kinegal, and the gentlemen in charge of hospitality were Stillman and Percy Deverill. Miss Annabel Low who married Ruddle is the eldest daughter of Mr. and Mrs. Low of this town. She was a student who graduated from the College of Kapunahou [Punahou] three years ago, and after some time in the teachers’ school, she was appointed as a teacher at a school on Hawaii Island, where she first met this man whom she wed, Mr. Ruddle, who is employed in a high position at the volcano. They will be returning to the Kanilehua of Hilo on Wednesday’s Mauna Kea where they will make their permanent home from here forth. Ka Nupepa Kuokoa, Buke XLVIII, Helu 28, Aoao 6. Iulai 12, 1912. Here you’d be looking at a long strings of @@@@@@@@@ instead of information on Queen Kapiolani and Puna. 1876. Please let us shake hands, your Captain and I, and insert my small contribution in an empty space of your delicate body. On the evening of the 12th of Nov., Queen Kapiolani and her younger sister Kapooloku, Hon. L. Kaina, and the other companions of the Queen left Hilo Hanakahi and the Kanilehua rain. And the land travelling canoes that evening were pointed towards the seas of the rustling pandanus groves, and they reposed at the home of R. Lyman, Esq., along with the woman who lives in the sea of Haena in Keaau. And the next morning, the entourage of the Queen travelled on to see the sounding pebbles of Aalamanu, and from there, to Keauhou and the shelter of coconut fronds. And aloha was shown between the Queen and her humble subjects. 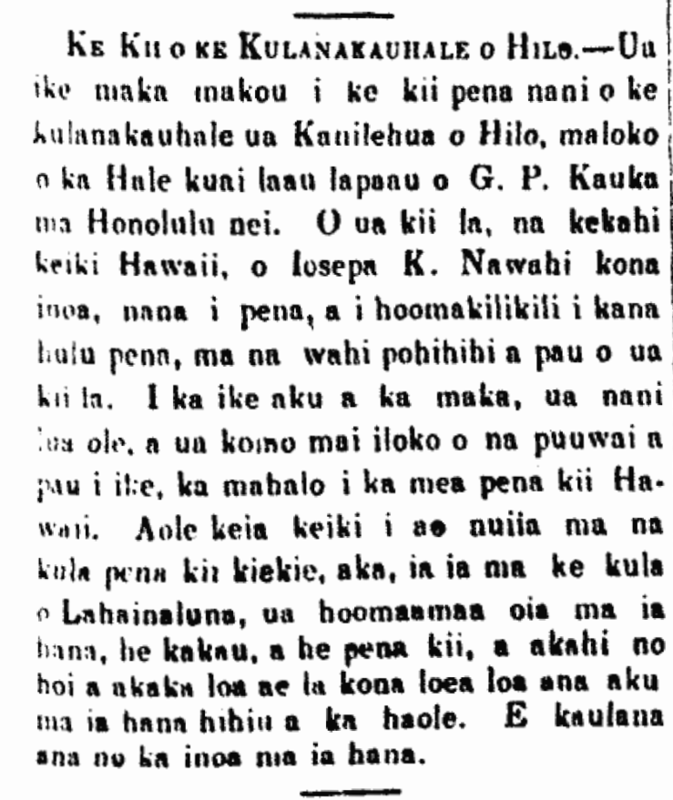 Keaau, Puna, H., Nov. 27, 1876. [This paper was not typed from the unclear images available online, but from the originals. So luckily, all of those @@@@@@@@@@ portions have been transcribed and are available online. Still, it would still be worth getting the best images even of these pages, so that the typescript can be compared to the original for questionable phrases.